Взбалмошная капризная маленькая принцесса, может и не красавица внешне (как «положено» принцессам) - героиня британского мультсериала – тем не мене полюбилась многим маленьким зрителям. Ведь своими постоянными «хочу» и «не хочу» «люблю» и «не люблю» она так похожа на них самих. И им так хочется, чтобы их затеи, причуды и желания если и не выполнялись в полном объеме, то хотя-бы не отвергались взрослыми…. В раздачу вошли все эпизоды 1-го и 2-го сезона, демонстрировавшиеся на британском телевидении, распределенные на тематические сборники. Каждый эпизод представляет собой законченную историю. Ведь на Маленькую принцессу невозможно обижаться! О языке: не сложный для восприятия даже на самых ранних стадиях обучения, фразы продуманные, не перегруженные сложными лексико-грамматическими конструкциями. Речь не быстрая, слова произносятся четко с чистым британским произношением… Очень полезно присутствие за кадром еще одного персонажа – Рассказчика (Narrator). Приятный мужской голос (Julian Clarey) постоянно переговаривается с принцессой (Jane Horrocks) и комментирует ее действия – это очень полезно для развития диалоговой речи – умения вести разговор на иностранном языке… Короткие по объему незатейливые сюжеты легко пересказывать и разыгрывать по ним сценки…. 1. 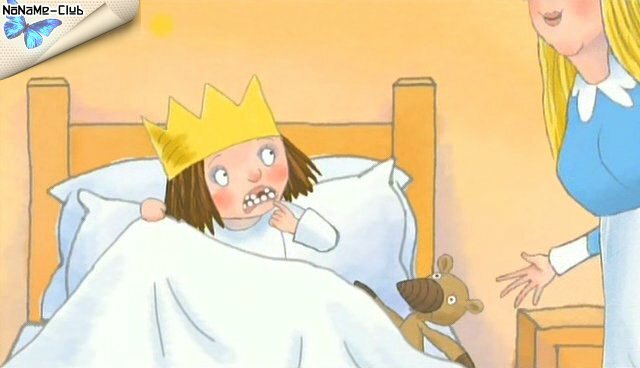 I WANT MY TOOTH [1x01] - Little Princess has a beautiful set of royal white teeth that she proudly shows off to her friends…until one starts to wobble. When the tooth falls out she panics as everyone prepares to smile for the royal family photograph! 4. I DON’T KNOW WHAT TO BE [1x04] - Little Princess can’t decide what she wants to be when she grows up. She sets about trying all her friends’ jobs and soon discovers that she’s good at being a Chef, Admiral, General and Prime Minister! What should she be…? Perhaps, … a Cat? 5. I CAN’T REMEMBER [1x07] - When Little Princess loses the Prime Minister’s precious medals and the General’s beloved bearskin after borrowing them to play with, she sets about trying to remember where they are…but remembering isn’t always that easy… Of course, her friends are not happy. 6. I WANT MY DUMMY [1x06] - Little Princess doesn’t want to give up her dummy, and when it starts mysteriously disappearing, she’s determined to get it back! She does not agree that she’s too old for a dummy but she does decide to compromise. If she has to give up her dummy then the Queen must give up her chocolate truffles. What could be fairer than that? It is Spring and Little Princess is spending time in the sunshine! Playing in the mud and meeting new friends like Taddy the tadpole and Speedy the Snail, join Little Princess as she enjoys springtime in the royal garden! Featuring 6 spring inspired Little Princess episodes! 1. I WANT TO WHISTLE [1x05] - Everybody in the kingdom can whistle, except Little Princess. And to make matters worse, she then discovers she can’t waggle her ears or her pop her mouth either! There must be something special she can do? 2. I WANT TO DO MAGIC [1x12] - Little Princess is having a magic show and needs to learn some tricks. Problem is, she doesn't actually know any magic. Thrilled when the Gardener shows her how things disappear, with the help of her friends she sets about learning some new tricks. But the Princess is in for a shock when the magic works a bit too well. Featuring 6 summer inspired Little Princess episodes! 3. I DON’T WANT TO SHARE [1x15] - It’s a hot day and Little Princess has a new paddling pool. Soon the whole household is in there cooling off. Finding she’s squashed, Little Princess orders everyone out, but quickly discovers that playing by yourself isn’t half as much fun. Featuring 6 autumn inspired Little Princess episodes! 1. I WANT A TRUMPET [1x14] - When a music box arrives at the castle Little Princess decides to learn to play an instrument too. But as she practises on her funnel trumpet it seems that not everyone in the castle appreciates her music as much as she does…. 2. I WANT MY VOICE BACK [1x17] - Little Princess loves to yell, although the rest of the household aren’t so keen. When Princess suddenly loses her voice, she must find a new way to make herself heard. And before long, everyone wants her to get her voice back! 4. I WANT TO COOK [1x24] - It is the General's birthday, and Little Princess decides to bake him a cake. But will the castle kitchen be big enough for two chefs? 6. BUT THEY’RE MINE! [1x29] - Little Princess is getting bigger. Try as she might, she just can’t fit into her favourite clothes any more. But this doesn’t mean she’s ready to give them up, particularly if she can still find a use for them? Join a chilly Little Princess in winter. In episodes including I Don't Want a Cold and I Want My Sledge, everyone's favourite royal rascal deals with things that all children desire, detest, play with and worry about. 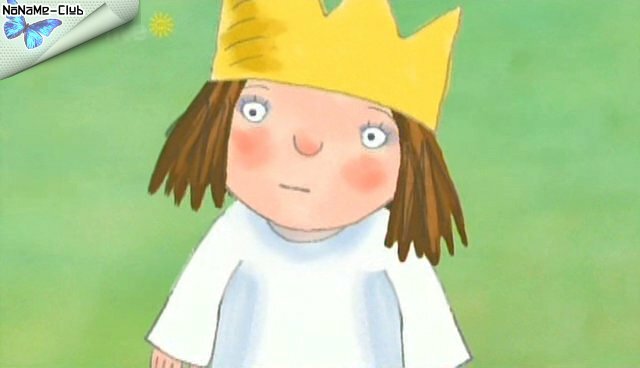 The stories in Little Princess incorporate a cast of colourful characters who entertain and perplex the Little Princess as she goes about her many adventures. Featuring 6 winter inspired Little Princess episodes! 1. 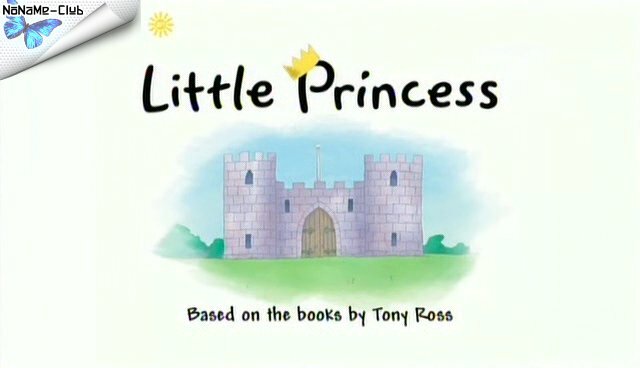 I DIDN’T DO IT [1x09] - Little Princess is allowed to build a den in the castle as long as she doesn't make any mess. As she sets busily about her work, things don't stay quite as tidy as intended. Then Scruff is blamed for all the mess and put outside in his kennel. Little Princess doesn’t know whether to confess and face the consequences? 2. 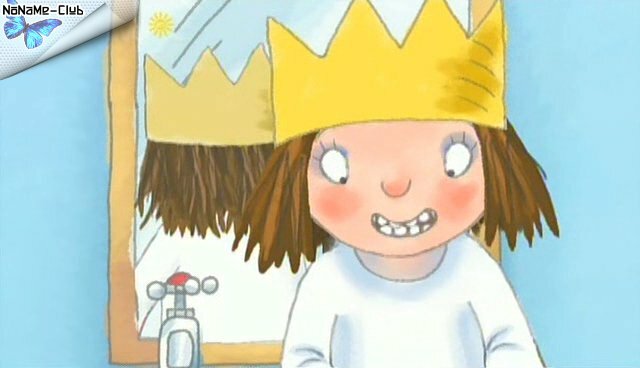 I DON’T WANT TO COMB MY HAIR [1x10] - The Little Princess hates having her hair combed. There are always tangles and it always hurts! When the King agrees to put her in charge of combing she makes sure that everyone in the castle has beautifully combed hair, but she leaves her own until last. Little Princess: Vol 6 - Let's Play /Игры Маленькой Принцессы или Давайте играть! 1. [2x01] - I Want A Shop - Little Princess decides to set up her own shop. She searches the castle, finding all sorts of interesting things to sell, and soon has lots of happy customers. 2. [2x03] - I Want To Be A Pirate - Little Princess decides to be a pirate. Much to her delight, she discovers that they are very naughty people, and they don't have to wash or do as they're told! 3. [2x05] - I Want To Dress Up - There is a fancy dress party at the castle and a prize for the best costume. Little Princess is determined to have the best outfit for the occasion, but all of her costume ideas seem to go horribly wrong. 4. [2x14] - I Want To Be Tall - Little Princess is just not tall enough! She can't reach the things she wants. So the only solution is to grow. 5. [2x16] - I Want A Swing - Little Princess has a brand new swing but is not allowed to use it unless an adult is around. 6. [2x17] - I Want To Be A Baby - When her baby cousin comes to stay, Little Princess finds that she is no longer the centre of attention. Perhaps she should try being a baby as well? 7. [2x18] - I Want To Be A Cavegirl - Little Princess decides to become a cavegirl so moves into the garden shed, practises special dances and goes hunting. But when it gets dark, living in a cave loses some of its appeal. 8. [2x19] - I Want My Puppets - Little Princess is putting on a puppet show for her friends. But as she prepares the tickets and refreshments, her puppets get all tangled! Will she manage to fix them before the curtain comes up? 9. [2x21] - I Want To Be An Explorer - Little Princess learns about her great grandfather, a famous explorer who discovered the Blue Boogaloo Land and the Red Wibbler. 10. [2x23] - I Want To Be Queen - Little Princess cannot understand why her Mum gets breakfast in bed and eats truffles all day when Little Princess is not allowed to. When Little Princess and the Queen decide to swap roles for the day, it soon becomes clear that being Queen is not that easy after all. 11. [2x29] - I Want My Sheep - Little Princess is playing vets and gets quite a shock when she comes across a real sheep in the castle grounds! After a while she and Sheepy become inseparable - and when the Gardener arrives to take Sheepy home, the Princess decides she really doesn't want him to leave. 12. [2x31] - I Want To Do A Show - Great Aunty is coming to visit so Little Princess decides to put on a show! Everyone in the household gets a trick to perform, but when rehearsals start, it becomes clear that the Princess has a lot of work to do before the big performance. Little Princess: Vol 7 - Lets Celebrate/ Праздники Маленькой Принцессы или Давайте веселиться! 1. [2x02] - It's Sports Day - It's sports day at the castle and the atmosphere is electric. The household all pick teams, but when the Princess ends up with Scruff and the Admiral, she is less than happy. 2. [2x04] - I Want To Go To The Fair - Little Princess is off to the fair, but in her excitement, she ends up hurting her foot. She is told she will have to stay at home with the Queen while everyone else goes. 3. [2x06] - I Want A Surprise - Little Princess is off to the fair, but in her excitement, she ends up hurting her foot. She is told she will have to stay at home with the Queen while everyone else goes. 4. [2x10] - I Don't Want To Kiss Great Aunty - Great Aunty is coming to visit and Little Princess is not happy. 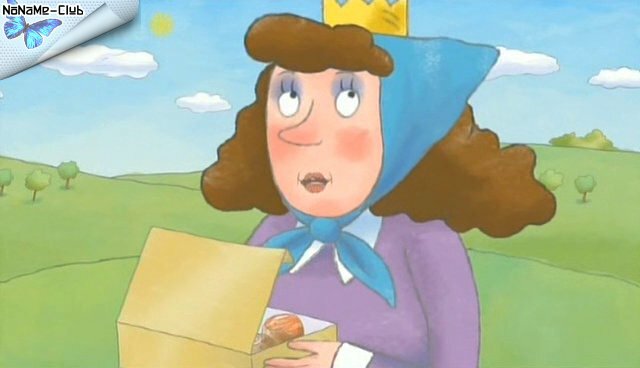 Great Aunty has got borrowed teeth, baggy tights and a scritchy scratchy chin, and - worst of all - the Princess is going to have to give her a kiss! How will she get out of this one? 5. [2x11] - I Want A Midnight Feast - Little Princess is going to have a midnight feast, so she creeps around the castle gathering up goodies. However, there is one big problem - she just can't seem to stay awake long enough! After a few failed attempts, it's the General who finally comes up with a plan to make sure they're awake for midnight. 6. [2x20] - Mother's Day - It is Mother's Day and Little Princess is busy making her mum a very special present. The Queen is very excited and is soon hot on the trail of her daughter and the mysterious present. 7. [2x24] - I Want To Play Football - There is a storm raging outside and the Little Princess is stuck inside the castle and bored, having played all her games twice over. When she discovers her football she thinks she has hit on the perfect game, but pretty soon realises that footballs should not be played with indoors. 8. [2x25] - I Want To Play In The Rain - Little Princess loves rainy days - there are so many puddles to splash in! But no one else in the castle wants to play with her - they want to stay dry indoors. Little Princess carries on regardless, until things start to go wrong for her and she decides that everybody else might be right. 9. [2x27] - I Don't Want To Dance - Little Princess does not want to go to her dance class because they make her dance like a butterfly. She sets about hiding from the maid, only to discover that there is more to dancing than being a butterfly. 10. [2x28] - I Want To Go On Holiday - When Little Princess receives a postcard from Great Aunty, she decides that she would like to go on holiday too. But with the whole household busy doing the spring cleaning, the Princess has to go on her own. She soon learns that holidays are not as much fun when you have no one to play with. 11. [2x30] - I Don't Want To Miss It - The princess keeps missing all the exciting things that happen around the castle, so decides to get her friends to call as soon as something happens. She soon discovers, however, that sometimes you just have to be in the right place at the right time. 12. [2x33] - I Want To Find A Treasure - The day of the castle treasure hunt has arrived and everyone is very excited! Little Princess did not find any of the chocolate eggs last year so this year she is determined. But to what lengths is she willing to go to achieve her goal? Little Princess: Vol 8 - Let's Be Good/ Умница – Маленькая Принцесса или Давайте будем послушными! 1. [2x12] - I Want To Be Good - Little Princess is on the Naughty Step. She has been told that if she wants to help decorate the Christmas tree, she must be good all day. But it turns out that being good just isn't that easy - will she make it? 2. [2x07] - I Want A Bicycle - Little Princess is fed up of her tricycle not going fast enough and decides that she needs a two-wheeler. 3. [2x08] - I Don't Want To Leave Home - When Little Princess overhears her parents discussing her, she thinks they are going to send her away. She tries hiding and saying she doesn't want to go but nothing seems to work. When the deadline finally arrives, the Princess discovers she might have got her wires a little bit crossed. 4. [2x09] - I Want A Best Friend - Everyone in the royal castle seems to have a best friend. Everyone, that is, except the Little Princess. When her baby cousin comes to visit she decides he will be perfect for the job. But best friends don't always do what they are supposed to. 5. [2x13] - I Want My Crayons - Little Princess has a lovely shiny new box of crayons. They look so clean and new that she doesn't want to actually use them. But when the precious crayons start mysteriously disappearing from their box, the Princess starts accusing members of the royal household? 6. [2x15] - I Want My Plaster - This episode finds Little Princess proudly wearing a plaster on her knee. When the General hurts his leg, the princess must show him how to be brave. 7. [2x22] - I Want To Collect - When Little Princess discovers that everyone else in the castle has a collection of some sort, she decides she needs one too. She sets about collecting all sorts of different things but it soon becomes clear that it is actually a little trickier than she thought. 8. [2x26] - I Want Baked Beans - When Little Princess discovers that she likes baked beans, she decides she wants to eat them all the time - much to the household's dismay. But after a while, they start to lose their appeal - especially when she realises that she might be turning into one. 9. [2x32] - Can I Have It Back Now? - When Little Princess's baby cousin comes to visit, she decides to be very kind and lend him Gilbert for the day. But to her horror, everyone thinks that she has given the teddy to him for good! 10. [2x34] - I Don't Like Thunderstorms - Little Princess is playing outside when a massive storm hits the castle, forcing her indoors. Suddenly she realises that Scruff is stuck out in the storm, but does she have the courage to rescue him? 11. [2x35] - I Can Keep A Secret - Little Princess learns a secret about the General that nobody else in the castle knows. Will she manage to keep it from the rest of the household? Время раздачи: 24/7 (круглосуточно) - до 5 скачавших, далее по возможности. Ну и конечно, данный материал выложен исключительно для ознакомления. После просмотра Вы обязаны удалить все файлы, отформатировать жесткий диск, разбить его молотком, облить кислотой и сжечь остатки в микроволновке. А есть 3 сезон на английском?